The quality of water in rivers and downstream lakes and estuaries strongly affects how we can use it and what value we place on it. And to define water quality, it is imperative to make long-term, national measurements. 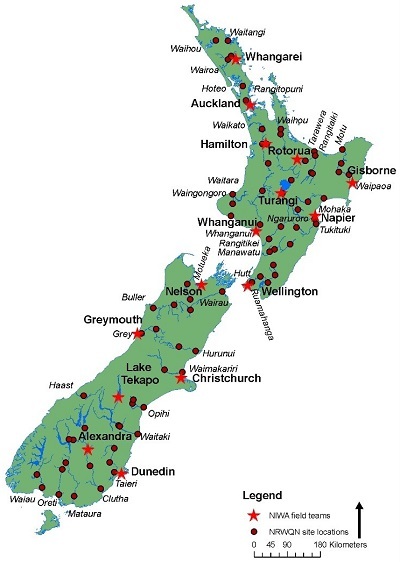 Much information on the water quality of New Zealand rivers at national scale has come from monitoring at 77 sites in the National Rivers Water Quality Network (NRWQN) operated by NIWA for 25 years. A much larger number of water quality sites is operated by regional councils, though almost all have been running for shorter periods. The 77 river water quality monitoring sites in the National Rivers Water Quality Network (NRWQN) operated by NIWA. The sites are mostly located close to flow monitoring sites. faecal microbial contaminants that can cause illness to people consuming water or recreating in rivers or downstream waters. ‘Point’ pollution from wastewater discharges (entering receiving waters at a point) needs to be distinguished from ‘diffuse’ pollution arising from land use. Improved wastewater treatment over several decades has resulted in water quality in New Zealand being dominated by the diffuse sources – which are much more difficult to manage. There are three major categories of diffuse pollution: fine sediment, the major nutrients (N, P), and faecal microbes. Toxic metals may contaminate a small number of river waters within urban centres or downstream of mines. Compared with Europe, North America and Asia, river water quality in New Zealand is ‘fairly good’ overall, though conditions vary greatly from place to place depending on land use. Water quality is very good (i.e. supports most values including habitat for aquatic life) in rivers draining conservation lands. Conversely, there is widespread diffuse pollution from developed land, particularly pastoral agriculture which degrades rivers with fine sediment (reducing visual clarity), faecal microbial contamination, and nutrient enrichment. Water quality in rivers can also vary greatly from one day to the next. Even rivers that have good water quality most of the time may be turbid and polluted by faecal microbes during floods or high flows. Typically, diffuse pollutants move mainly during storm flows, in sharp contrast to contaminants from wastewater which are highest at low flow when dilution in receiving rivers is least. A relatively few urban- and mine-affected rivers in NZ probably have the worst water quality because of mobilisation of toxic contaminants such as heavy metals as well as severe habitat modification. All three major categories of diffuse pollutant are mobilized on grazed livestock pasture (40% of NZ’s land area), resulting in degraded water quality in rivers draining pastoral catchments. As might be expected, diffuse pollution from pastoral agriculture tends to increase with land use intensification. Cropland (about 1.5% of area) yields somewhat degraded water quality owing to mobilisation of nutrients and fine sediment. Plantation forests (7% of land area) generally yield appreciably better water quality than pasture, and rivers draining plantations sometimes approach the quality of rivers in native vegetation cover, although periodic harvest operations can mobilise fine sediment. The water quality of numerous rivers in New Zealand has generally been declining over the last 25 years, despite a very large expenditure on improved treatment (or diversion from rivers) of city and factory wastewaters. However, the gains from this point pollution control have been outweighed by steadily increasing diffuse pollution, particularly nitrogen and phosphorus enrichment from intensification of pastoral agriculture. Fortunately, there have been encouraging signs of late that river water quality declines can be arrested, or even reversed. Water quality appears to have recently improved in a few polluted rivers in certain catchments and regions where there has been major effort on improved land management (e.g. riparian fencing and planting), soil conservation and nutrient controls. Continued improvements in river water quality are expected to be an enduring challenge while intensification of pastoral agriculture and urban expansion also continue. This will be further exacerbated by global warming driving increases in river water temperatures and declining river flows in some areas. Dr Rob Davies-Colley is a principal scientist for water quality at NIWA. Davies-Colley, R. J. (2009). Land use and water quality in New Zealand – an overview. Water 162: 32-35. Davies-Colley, R. J.; Smith, D. G.; Ward, R.; Bryers, G. G.; McBride, G. B.; Quinn, J. M.; and Scarsbrook, M. R. (2011). Twenty years of New Zealand’s National Rivers Water Quality Network: benefits of careful design and consistent operation. Journal of the American Water Resources Association 47:750-771. I’d say, According to the last OECD water quality review New Zealand’s water quality was excellent. The 3 rivers assessed (including Waikato) were in the top 4 for nitrate. 2 of the 3 were in the top 25th percentile for phosphate with the Waikato only just falling out side this category. Of the lake data considered Taupo was our only lake considered. It was the best lake (out of 50 odd) for Nitrate and Phosphorus in the top 25th percentile. Based on this information I can only view water quality to be ‘excellent’. ‘Fairly good’ is an understatement in my view. If we use ANZECC & ARMCANZ 2000 as our benchmark, we could say most our pastoral areas are bad, as are our Urban, as are our exotic forests as are our Native forests. Larned et al 2004 reported over 80% of our native rivers failed based on clarity. Native rivers were the 2nd worst category for clarity (behind exotic forest) with clarity being in indicator of sediment. Similarly about 50% of native rivers failed on E Coli. The word pollution is not well defined and has negative connotations and offends people when they are labelled with it. Because it is a relative term and relatively to other countries NZ is ‘excellent’ we need to use it less in my opinion. Instead we should be using phrases such as ‘not meeting standards’. And ‘quality reducing components’. Splashing around the word pollution and polluters will not achieve support to focus on our areas that need work. Increasingly nitrate seems to be the quality reducing component that we have greatest challenge effecting. In my opinion, as it is a complex issue, people are the solution and positive reinforcement is required to get their buy in. Negative press will simply find people looking to protect their position. Using things like the OECD data, Larned, and the latest MFE findings. The term intensification is on the way out with a relationship between intensification and MFE’s latest findings showing a positive correlation between intensification and water quality. Water quality is and issue of trends and context. The more I read the more reasons I find to view it as excellent and improving. When we are tough on ourselves it seems because of our tough standards. But when we line native forests up with these standards, they are not so good either. The opportunity to improve water quality further lies with people and in my opinion people need positive reinforcement to take on this challenge. Putting water quality into context could be this reinforcement. Rob will be able to comment on these points later, but let me mention now that future articles will cover lakes, agriculture (from several vantage points), and solutions (again, from several vantage points). One point that will certainly come up time and time again is that water quality is relative: “good” depends on how you value water and what the water is for. Implications of different water qualities is the second act in the series. This is in response to the comment of Mr E on myWaiology posting of 18 October 2013. My description of NZ rivers as “fairly good” was a considered attempt to provide a useful picture of NZ’s international standing while being acutely mindful that river water quality can vary greatly across NZ or even in the same river, and from day to day. The OECD assessment is not very helpful given that so few NZ river monitoring sites were considered. In contrast, the 77 sites of the NRWQN give a comprehensive national overview and basis for a meaningful international comparison. (Even better would be to use regional council data including for a small number of very degraded rivers not represented in the NRWQN.) Characteristic river water quality at the 77 NRWQN sites is appreciably variable: for example median visual clarity ranges more than 100-fold from 5.5 cm in the Waipaoa River at Kanakania near Gisborne, to 11 m in the Motueka River at the Gorge, Tasman District. The Larned et al. (2004) paper reports (Figure 3; p 355) median visual clarity in the order “Exotic” > (native) “Forest” > “Pasture” > “Urban”. (High values of visual clarity represent good water quality.) Few individual lowland rivers in the exotic and forest land cover classes have visual clarity below the cited guideline (1.3 m). In contrast, many lowland pasture rivers and most urban rivers are less clear than this guideline and so are less often suitable for swimming and as habitat for aquatic life. As regards trends in river water quality, the Ballantine and Davies-Colley (2013) paper (cited), which is based on work that MfE commissioned, reports patterns of generally increasing nutrient enrichment over the long-term for NRWQN sites in the period 1989-2009. Above, I write that some individual, relatively polluted, rivers have shown recent indications of an improving trend (e.g., reducing nitrate) – which is encouraging. But we shouldn’t obscure the fact that river water quality is appreciably degraded in developed land in NZ, and the degree of degradation correlates strongly with the amount of development within a catchment. (Davies-Colley 2009; cited). The NRQWN is not an international study. Carried out on the same basis throughout the world. I’m not so sure it makes a good basis for comparison when methods will vary. But I tend to agree regarding the OECD data, it appears to have weaknesses. That said I still consider it to be one of the better ‘even ‘ comparisons. But it would be fair to say I would like to see this database stronger. Because MFE cited the OECD data, do you think they are cherry picking information that looks good? You are right regarding clarity data. I was holding the graph upside down. Still my point regarding ecoli is appropriate. Most people would not realise that our native water ways contain a significant level of E coli and DRP for that matter. I think native rivers are a good benchmark for “pollution”. Should we expect the pastoral and urban sectors to improve water quality beyond this point? And if so should we still call them polluters? If they do go past this point do we call these sectors ‘water filters’? Why are MFE reporting good news when your report seems to say otherwise? Is it simply and issue of time scale differences? Yours being 1989 – 2013. Theirs being 2003-2013. If it is simply timing, what is the better time frame? If we are trying to measure the impact of recent changes surely short is better? Or is it simply a case of cherry picking? Again? The value in the NRWQN is its extent and duration, plus the attributes it measures. I imagine it would be hard to measure [N], [P] or DO differently from country to country. Clarity, perhaps. On the issue of benchmarks, that’s a tough issue whatever environmental science you’re talking about. What is natural? How unnatural is good enough? And how does this vary from place to place? Ecologically, water quality that is natural for a forested mountain stream would be different from that of a lowland, spring-fed stream, and so the flora and fauna that “belong” there would be different too. As for land uses that improve water quality: riparian strips, rain gardens or bioswales, engineered wetlands, and probably others. Modified land use doesn’t necessarily pollute.